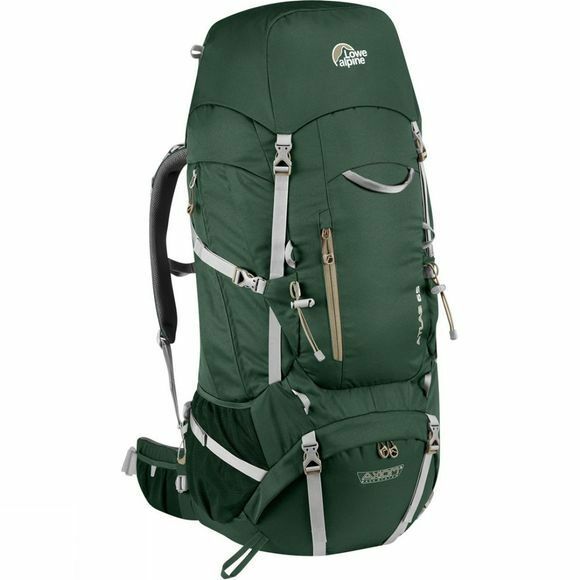 The Lowe Alpine Atlas 65 Rucksack is ideal for anyone starting out in backpacking, complete with the benefits of easy to use technical features. The Axiom 3 back system is supportive, stable and easy to adjust. The pull cord allows you to slide the shoulder straps to adjust your back length quickly and efficiently, creating a more even distribution of weight. With turned shoulder harnesses reducing the chance of discomfort between the straps and your chest. There are further strap pulls across the hips, chest and back ensuring a fully adjustable comfortable fit wherever you sense of adventure takes you. The pack has two compartments with a zip out divider so that you have the option of just one large compartment and there are two large bellows side pockets for any small extras. Lash points also feature on the outside of the pack allowing you to add extra kit, particularly a bulky item such as a foam roll mat. There is an integrated raincover to protect your kit from downpours and it is hydration compatible if you wish to add your own bladder system. There are two hipbelt pockets which allow you to keep your camera close to hand, or nibbles if you like to snack enroute. This bag can accommodate walking poles as well as an ice axe making it an ideal multi-day companion for year round trips.